Xiaomi Enters India Sooner Than Expected! Chinese phone maker Xiaomi is coming to India. Xiaomi had already announced plans to enter several key Asian markets last year. That isn’t all; the US Smartphone market is also on the Xiaomi’s radar. However, while analysts were expecting the company to make a bombastic entry in India around Diwali (When people usually go crazy over new electronics), it seems like Xiaomi has preponed its plans and will begin selling handsets sooner. Let’s hold on for a second. Xiaomi? Who are they? Founded by Lin Bin in 2010, the consumer electronics oriented company has grown at a phenomenal rate by offering top-notch Smartphones at hard-to-beat prices. How does the company do that? Well, their philosophy is to not spend money on large advertising campaigns. Instead, Xiaomi owes much of its popularity to technology blogs and through word of mouth. Three years and 3,000 employees later, having also acquired Google’s Hugo Barra last year, Xiaomi made a stunning $5.22 billion in revenue in 2013. After dominating the Chinese Smartphone market, taking it by surprise, Xiaomi also introduced its own wireless routers, Xiaomi TV and the Xiaomi MiPad, their first tablet that is powered by the NVIDIA Tegra K1 32-bit processor. However, the company’s biggest sellers, in the near future, will remain its flagship Smartphone lineup. The Xiaomi Mi3, which costs just $320, sold out in minutes. Also, the company’s affordable lineup – the Xiaomi RedMi and HongMi series – are selling like hot cakes. 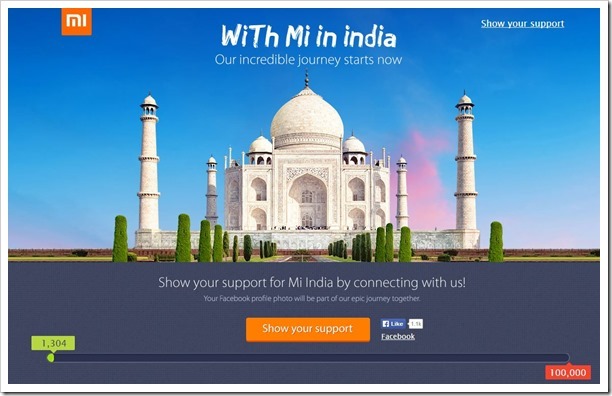 Xiaomi has launched their Indian website, and it can be accessed at – http://www.mi.com/in/. There’s an interesting story behind their domain name Mi.com – it which was purchased in April 2014 for a record $3.6 million. Mi.com replaced the company’s older Xiaomi.com domain. Can Xiaomi become a dominant player in India? So, having told you about the history of Xiaomi, you begin to understand how the company could potentially dominate the Indian Smartphone market in the near future. Not only are Xiaomi’s products affordable, they are actually quite good. Instead of using cheaper components or replacements, the Mi3 packs the power of a quad-core Snapdragon 800 SoC, coupled with a 5″ Full HD display that has been rated as excellent by reviewers across the board. So, you see, Xiaomi isn’t like Micromax in China (which is a popular belief in India). They don’t sell rebrands; they make their own phones, and they make it good. Granted, the Indian market is more crowded than ever, but quality always gets rewarded. Imagine, if in a month from now, you could pick up the Xiaomi Mi3 for just Rs. 20,000, or a RedMi or HongMi handset for Rs. 10,000. People would flock towards the brand like children do with cotton candy. Backed by a multi-billion dollar enterprise and lead by Google’s ex-VP, Hugo Barra, Xiaomi already has a brand image and reputation that far exceeds the that enjoyed by other Chinese brands! If you ask me, I would ditch my Rs. 40,000 Xperia Z1 for a Rs. 20,000 Xiaomi Mi3 in a heartbeat. I would get to use the latest MIUI custom-OS (based on Android), which is one of the most beautiful skins for Android in the world. Custom ROMs for every popular phone have atleast one MIUI ROM among them. Color OS, Amigo UI etc. are all based off MIUI, which can basically be thought of as a mash-up of iOS and Android. Only, in many cases, it is more aesthetically pleasing and practically useful than other. Things are looking good, really good. In fact, I wouldn’t be surprised if the company met with the same level of success as they had experienced during their Singapore launch earlier this year, where the Xiaomi Mi3 sold out in under 2 minutes flat. Let’s see how long that takes in India. I know, I’ll be waiting to hit the ‘Buy’ button. What about you? Remember when I said Xiaomi doesn’t spend money on large advertising campaigns? Well, they do have to advertise, no? Their medium of choice is social networks and blogs. You can show your support to Xiaomi’s Indian division by supporting them on their official website and liking their Facebook page. The target is a easily-attainable 100,000. Ready? Get, set, go!